The list is incomplete - I request my friends to provide me the missing names so that I can complete the list. 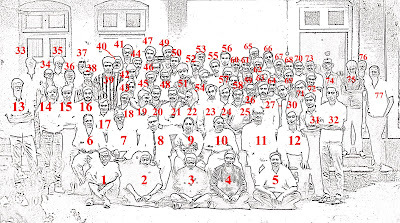 I think the picture was taken by none other than K.K.Jaiswal as he is missing from the photo. The light was fading as it was quite late in the evening and some more photos were taken, one of which is given below. 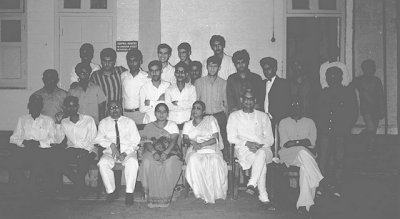 Baba Majgavkar ( standing first from left) Surendra Sahu (centre with glasses)Deepak Dhar (tall person in the back row) are among the few in this smaller group. 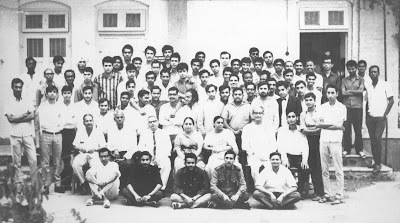 I found another photograph , which was slightly out of focus with a slight rearrangement, this time I am sitting down in the front row ( second from left) flanked by K.K.Jaiswal on my right and Baba Majgavkar on my left. Hi I am Akki Hame chandra's daughter, Do you have any more pics of his, if you do, could pls share them with me, i will be very greatful.